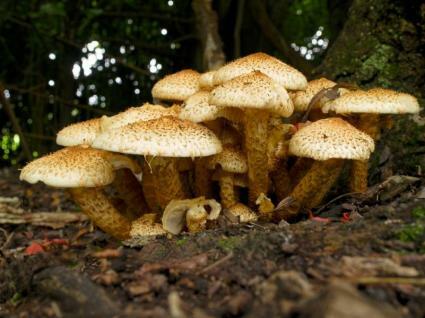 Gardeners worry about fungus infections appearing in their gardens. Usually, however, the problem can be prevented with good management. When black spot or rust does appear, treatment is quite simple. It is important to remember that many beneficial fungi also live in gardens. They improve the soil and help plants absorb nutrients. Black spot is caused by many different kinds of fungi, each of which attack only one or two species of plants. The circular black spots develop first on the top of leaves, which will turn yellow and drop. Lesions may also develop on stems or branches. Peach leaf curl causes the edges of the leaves to become wrinkled, twisted, and curled. They often show a change in color, to yellow or shades of purple and red. Then the leaves turn brown and drop. A severe infection can defoliate an entire tree. Honey fungus and fairy ring fungi appear as types of toadstools in the garden. Honey fungus invades the roots of woody plants, while fairy ring fungi cause circles of discolored turf. Potato blight is the most widely-known fungal infection, as it caused widespread starvation in the 19th century. It first appears as black or brown patches around the edge of leaves. In damp weather, the patches enlarge and spread to the stem, killing the plant. Tubers show a reddish-brown rot and discolored skin. They are also vulnerable to bacterial infections. The same fungus will attack tomatoes and some ornamental plants. Clematis wilt is caused by the fungus Phoma clematidina. One or more clematis shoot will start to wilt at the tip or at a leaf and the wilt will spread downward rapidly. The leaf stalks become black and newly-infected stems blacken internally. This fungus can remain in the soil for many months in old infection plant material. Fungi are spread by spores. The spores are most commonly dispersed by wind and by water splash. They are more likely to grow if they land in moist areas. Making sure your garden has good air circulation will reduce fungus problems. Don't space plants too closely, and prune shrubs and trees as needed. Don't allow clumps of weeds to invade garden beds. Water your garden in the morning. This will allow foliage to dry completely, making it less hospitable to spores. If you notice infected leaves, remove them immediately. Pick up any possibly infected leaves that have fallen to the ground. Cut diseased canes or stalks to the ground or, if necessary, below the ground. Don't compost this material - destroy it! In the autumn, remove all dead plant material from species most susceptible to infection. Destroy it. Fungicides can be based on copper or on sulfur, both of which disrupt fungi development. They are available in liquid and powder forms, and can be sprayed or dusted on garden plants. Be very careful to follow safety instructions carefully, as either kind can be harmful to humans and animals if applied incorrectly. Some gardeners dislike the look of lichens, moss, and fungi growing on tree trunks, but they cause no damage to the trees. Bracket fungi grow on many different kinds of trees. Some, like Ganoderma and Fomes species, and be found on many species of host trees, while others prefer a specific host. 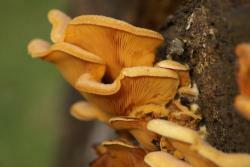 Meripilus giganteus is found on beech trees, and Inonotus hispidus is found on ash trees. Bracket fungi live on deadwood, so if trees in your garden are hosting them, have the trees inspected by a knowledgeable arborists. Their presence may indicate that the tree is injured or diseased. Spores from bracket fungi cannot penetrate healthy bark, but they will settle and grow where the bark is wounded. Mycorrhizal fungi make other nutrients more available to plants. Organic fertilizers and soil conditioners increase the action of mycorrhizal fungi and benefit all the plants in the garden. Saprophytic fungi appear as a network of fine, white threads in the surface layers of soil. They look alarming, but they are very helpful to garden soil. They feed on the remains of dead plants and animals, helping to decompose organic matter. This improves the fertility of the soil. Toadstools are the reproductive structures of some complex fungi; the main body is a network of threads below the soil. Many toadstool fungi form ectomycorrhizae, beneficial association with tree roots. They colonize outer layers of the root, which increases the absorbing surface of the tree's root system. This helps trees take up nutrients and protects roots from attack by some pathogens.